I believe that everything in our lives is a manifestation of our thoughts. I believe that I have the ability to create an abundant business and life, in fact I believe it is already manifested – I just have to drop the ‘lack of’ vibration and get into alignment with it. I love that you get that. Not many people in my circle understand it, let alone live it. 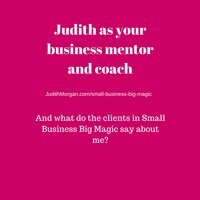 From the initial one to one chat, which really made me feel as though you really wanted to get to know what I was about, I felt a real connection and that you ‘got’ me and my fledgling business. However it works, it’s down to you Judith, leading your groupies with enthusiasm and joy every single day. Thank you and thank goodness for that. Your encouragement and validation – these are probably the most important. I also really appreciate your ability to pinpoint the best next step to go forward, thus saving me time and headaches – for instance…dedicating all my energy to ONE activity, the one I prefer, was SUCH a step forward! Your particular approach to problem-solving and improvement-making is an excellent fit for me, because you take the time to tailor your suggestions to what you already know about me, my style, my mission – not generic tips straight out of the coaching game plan du jour. Knowing someone is on your side, willing you to succeed, means a great deal to me especially when you are surrounded with people who would challenge you or not understand. I feel you get me. It comes from doing what you love yourself and not being fazed by intuitive/spiritual stuff or reasons I do things, as well as you being a whiz with figures (which I intensely dislike!). The fact that you are right there, ready with a quick response, so often. Your generosity with your time and effort on everyone’s behalf. Really going the extra mile to help, really genuinely caring. It shows. Your personality was a big factor in me signing up, it felt like I was talking to a friend rather than a “coach”. You care about each and every one of your clients and when life gets busy and we go quiet, you seek us out to see how we are doing, which is always appreciated. I feel very valued. Your ability to get to the nub of the issue, to focus on what really matters even when – or especially when – we don’t know what it is. I love your style of listening and quickly grasping the issue, but that you are equally happy to explore and take time to tease out threads that we may overlook. Lots of common sense and love and support given. I just wouldn’t want to be without it. If SBBM is beginning to sound like your cup of tea, why not contact me to talk about whether or not it’s the solution you’ve been looking for in your life and business? We’ll have a no-strings Skype chat.